Harris Health System values the pursuit of education and research. Our commitment to offer education and training to healthcare providers is a key component of our mission to provide high-quality care to Harris County residents. Harris Health offers high-calibre fellowship and residency programs in several areas including Pharmacy, Physical Therapy, and Clinical Pastoral Education. Harris Health System in Houston, Texas is accepting applications for a year-long CPE Residency beginning September 18, 2017. Four positions are available with a competitive salary plus benefits and generous paid time off. Harris Health System is one of the largest safety net healthcare systems in the nation. We are the first healthcare institution in Harris County designated by the NCQA as a Patient-Centered Medical Home. Our system includes 28 community health and specialty centers, an HIV clinic, a rehabilitation hospital and two full-service teaching hospitals. Ben Taub General Hospital has 586 beds, a renowned Level One Trauma Center including Houston’s only psychiatric emergency center. Lyndon B. Johnson Hospital is a 328 bed General hospital with a regional center for neonatal intensive care. Harris Health is a unique and challenging environment for learning and practicing the skills of spiritual care. Harris Health System is proud to present two physical therapy residency programs. Please see below for specific details on each program. Fees can be paid online or by check through the HCHD Foundation under the designation of Physical and Occupational Therapy Services. Please include the applicant’s name in the comments. More information on submitting your fees can be found at www.hchdfoundation.org/donate . 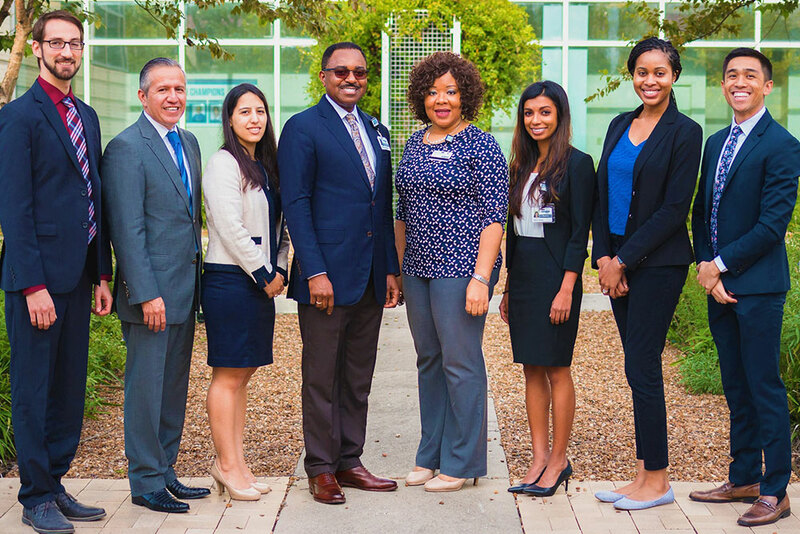 The Harris Health System Department of Pharmacy (DOP) prides itself in providing comprehensive, cost-effective pharmaceutical care to Harris County patients. With over 400 Administrative, Ambulatory, Clinical and Inpatient personnel, the Department of Pharmacy provides patient-focused pharmacy services to build a healthier community. If you are looking for a Pharmacy Residency where you can learn more, do more, and be more, consider Harris Health System.